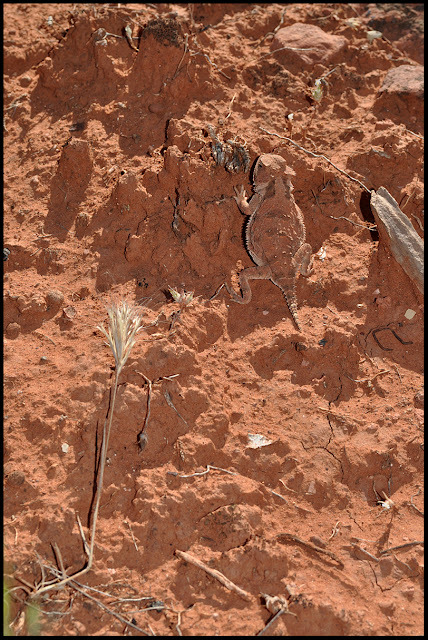 Did you guess the side of a Desert Horny Toad Lizard? If you did, you were right! How neat is that? We saw him on a hike we took up in Sedona on Mother's Day. The only reason we were able to see him is I was taking photos of cactus flowers (hence looking down) and he scurried by. That camouflage is probably the reason I've never seen one in the wild, even though I've lived in Arizona all my life. Another photo I took on the hike - the desert is alive with color right now. I think this tiny cactus looks like it's holding up its flowers with pride. I'm having a rather large garage sale this weekend that I am decidedly unprepared for. This means I'm checking out of blogland until next week. I knew it! Isn't it cool how well they blend in to their background? Love this pic. very cool! I was completely baffled. Good luck with the sale! I am sure your garage sale will be a huge success!!! Nope I did not guess that- looked like a bit of rusty machinery to me- my boys would get a kick out of seeing something like this on one of our desert hikes. So cool! This native Arizonan has never seen one either! The camo is absolutely amazing! Mother Nature is something else! I thought it might be too curved to be a blade but as I had just dusted the saw blade that was all I could think of. I could tell you where in Sedona because of the color of the dirt. The Gila Monsters are out now, this is their month to mosey around before they go back underground. They come out every once in awhile but mostly live underground. I have a family who live on the west side of my home, there is Ethel, Fred and little Ricky. Yes I name the animals who live around my home and visit me often. I am so weird ! Oh how cool! What fun to be able to hike in the desert! Great photo! And I was right that it would hurt to grab the wrong end of this guy. Nature never ceases to amaze. What an incredibly cool guy - I thought it was the spokes of a bike wheel! Missed the post, but I would've probably guessed some rusting metal or something. How cool! Love the pics! Jeanette I thought it was a rusted metallic blade of some kind!! Oh my goodness I would of never guessed. It's a what??!!! Thank God it would fit in the palm of your hand.....otherwise I would be very worried for you. Hope the garage sale was profitable. Have fun at the beach and look for pelicans!